Large environments require different techniques in rolling out software packages. This is also the case for VMware Tools. You can of course right click on the virtual machine in the vSphere Client and select Guest > Install/Upgrade VMware Tools or even create a PowerCLI script to do the job for you. But sometimes, and common in large environments, you need to comply with the IT infrastructure policy and install your VMware Tools by using a software distribution tool like Microsoft System Center Configuration Manager. For this you need to know how the VMware Tools MSI package is installed and which options you want to install. For this Valentin Hamburger, Technical Account Manager @ VMware, has written a great PDF document containing the decomposition of the VMware Tools package. 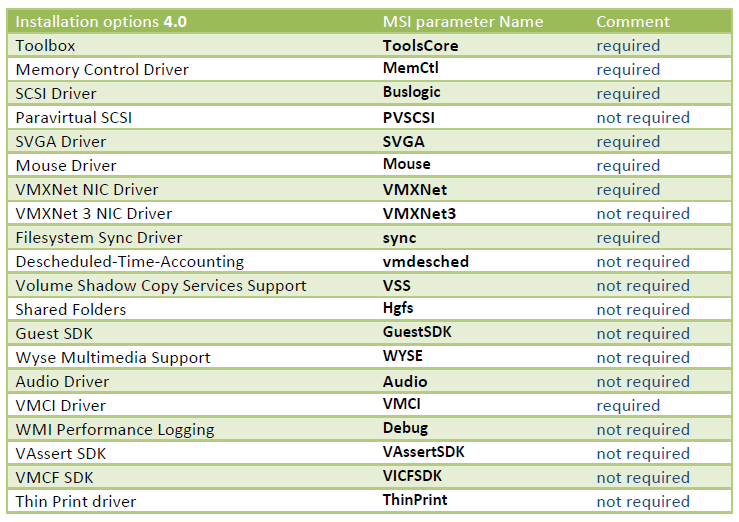 The picture below shows the various installation options from the VMware Tools MSI package and if they are required or not.